The Name of Jesus Worship will be celebrated the weekend of December 31, 2016/January 1, 2017, at St. John's Lutheran Church in Norfolk, Nebraska. Come Saturday night at 5 PM, or Sunday morning to a special 10 AM worship time. From the beginning, by virtue of our baptism, we are called Christian. We were “Christ-ened” at the font. Bearing his name, we share the same Father and are invited to address him intimately: Abba! Jesus bears our sins in humble obedience to the will of the Father. Today we pray that the mind of Christ, whose name we bear, would be our own. It is a good way to begin, again, another year. Merry Christmas from St. John's! 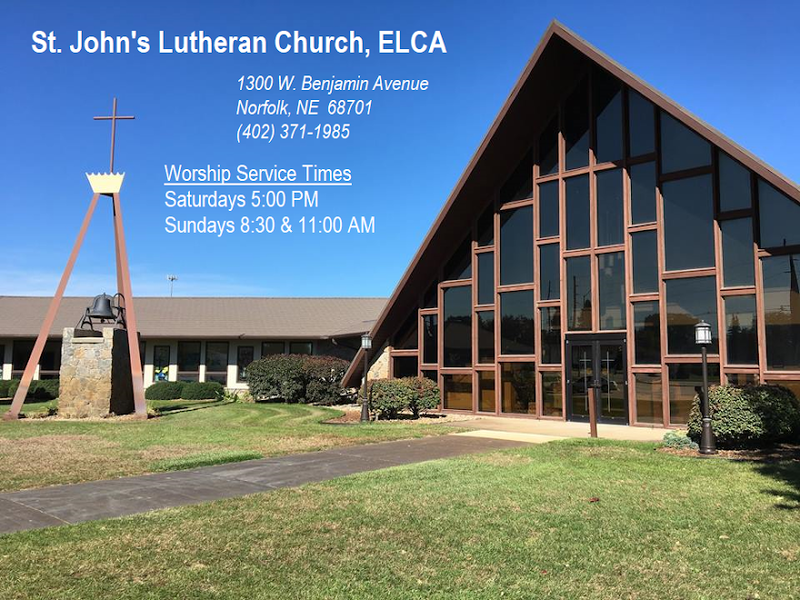 St. John's Lutheran Church in Norfolk invites you to worship with us this Christmas weekend. At 5 PM, join us for The Essence of Christmas. Sing hymns, hear the story of The Perfect Christmas Tree read by Pastor David Cox, enjoy Holy Communion & Candlelight, and receive a special gift to take the story with you. At 7 PM, join us for A Christmas Night. This traditional service includes hymns, Christmas Eve lectionary readings, a sermon by Pastor Justin Wiese, Holy Communion, & Candlelight. At 9 PM, A Festival of Lessons & Carols concludes our Christmas Eve worship. No sermon is preached, but a variety of Scripture lessons & traditional carols fill our worship. Holy Communion & Candlelight will be included in this service, too. 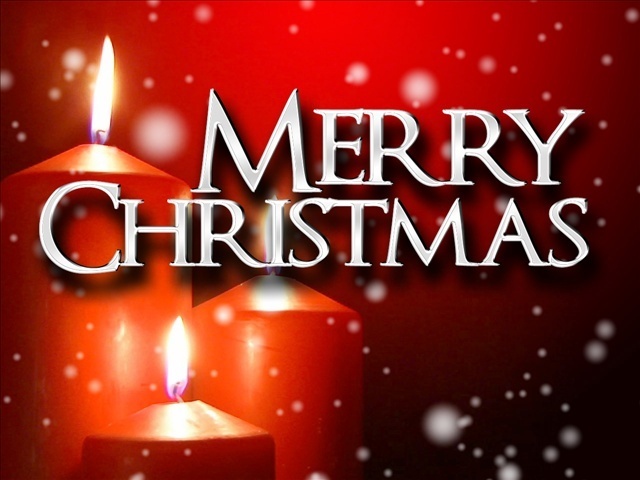 Christmas Day will be celebrated on Sunday, December 25, with only one worship service at 10 AM. Come enjoy the festival of the nativity as we celebrate Jesus' presence among us. Holy Communion will be celebrated Sunday morning. St. John's Lutheran Church Council in Norfolk invites all St. John's members to attend the Financial Forum on Sunday, January 8, 2017, at 9:45 AM, as the proposed general fund budget of 2017 is reviewed prior to the 2017 St. John's Annual Meeting, which will be held Sunday, January 22, 2017, at 1 PM. A narrative budget which outlines the vision for ministry at St. John's will be available soon. A quorum is not required for the financial forum, as no official action is taken at this information meeting. St. John's 2017 Annual Meeting will be held on Sunday, January 22, 2017, at 1 PM in the St. John's Fellowship Hall. Prior to the meeting, a Noon Potluck will be held. All voting members of St. John's are requested to attend this meeting to elect council members, Benefaction Board members, Legacy Board members, and 2017 Nebraska Synod Assembly Voting Members, as well as vote to approve the proposed 2017 General Budget. A fifty voting member quorum is required for the meeting. On December 17 & 18, St. John's Majesty Choir presents their Christmas Cantata at all three worship services. "Jesus! The Advent of the Messiah" celebrates the arrival of God's Son as all are invited to worship the Holy Child. "Jesus!" glorifies the Son of the Most High with both familiar melodies and new songs of praise, taking the Christmas experience beyond the manger to learn anew the story of the birth of our Savior, the King of Kings and Lord of Lords. St. John’s Lutheran Church in Norfolk celebrates "50 years on the hill” this Sunday, December 11, 2016. On this date, 50 years earlier, Pastor Richard L. Jobman and the congregation made the move from Second and Philip to the current location of US Highway 81 and Benjamin Avenue after a multi-year building program. “St. John’s has stood as a light on the hill. One cannot hide the light: it stands to give light to the Norfolk community. It is wonderful to be a part of their light, and the light of Christ in this place,” said Interim Senior Pastor Rev. Dr. David Cox. To recognize this special anniversary, St. John’s regular weekend schedule has been changed. No worship will be held Saturday night. On Sunday morning, a free-will offering breakfast will be held in the fellowship hall from 8:30-9:30 AM. During this time, St. John’s members will feature seasonal music. At 10 AM, a worship service will feature a rededication of the building and its furnishings. A Celebration of Wreaths, showcasing wreaths made by and representing the households of St. John’s, will be on display throughout the upper level of the building. Commemorative Christmas ornaments are also available for purchase. The public is invited to attend the celebration. For those parents who have a child/children who have been asking to receive Holy Communion, you are invited to attend a First Communion Class at either 2:30 or 5 PM December 7 in the sanctuary for a one-hour class with Pastor Justin as he reviews this sacrament with you and your child. First Communion will be celebrated on December 11 at 10 AM with those children/families who are able to attend our special 50 Years On The Hill Worship Service.